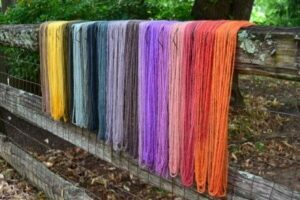 Mycopigments: Exploring Regional Mushroom and Lichen Dye Palettes - Land O' Lakes Area Artisans, Inc. 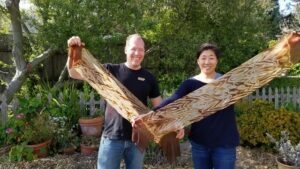 Calling all Fiber Artists, Eco-Dyers, Nature Lovers, and Fungi Fans! Cost: $375 All Materials Included. Deadline for Payment/Registration: September 8. No refunds will be given after the payment/registration deadline. Field Study and Foraging: Dress appropriate for outdoors for a short foraging walk in the wilderness. TBD. 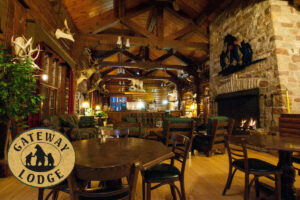 We will meet at LOLA and carpool to the trailhead for a mushroom and lichen ecology foraging walk. We will spend an hour and a half or so, looking at mushrooms and lichens; exploring their habitats, ecological niches and their features. We will look at live specimens, go over the steps for identification, perform spot tests, and discuss ethical harvest and environmental stewardship. Lunch: Bring a bag lunch – if the weather is nice, we can eat outdoors or head back to LOLA. Testing for color: We will start by making a dye experiment notebook. We will talk about using mordants and pH modification to maximize dye potential and the steps for testing for color and recipe development. At the end of day one, students will be prepared to explore mushroom and lichen dyeing on their own. Dyeing a rainbow of regional color: Using 10 species of mushrooms and lichens and established recipes, we will dye 15 or more samples – a full spectrum of color. We will talk about the best dye fungi, where to look for them and how to process them for optimal dyes. Lunch: Bring a bag lunch or visit area restaurants. Shibori: In the afternoon we will practice a simple yet elegant resist technique on silk scarves. Additional scarves will be available for purchase. At the end of the weekend, students will take home a mushroom dyed silk scarf, a rainbow of regional color samples and a two page color guide to the best regional fungi. Alissa Allen is an amateur mycologist and the founder of Mycopigments. 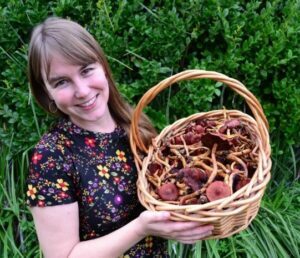 She specializes in teaching about regional mushroom and lichen dye palettes to fiber artists and mushroom enthusiasts all over the continent. Alissa got her start in the Pacific Northwest and has been sharing her passion for mushrooms for over 15 years. She has written articles for her website as well as Fungi Magazine and Fibershed. In 2015 she created the Mushroom and Lichen Dyers United discussion group and The Mushroom Dyers Trading Post. These groups have grown into a community of over 6000 members. Alissa uses brilliant colors found in mushroom dyes to entice people to take a closer look at mushrooms and their relationship within the ecosystem. To read more about her work, visit http://mycopigments.com/.